Brook Gardiner, left, Derrick Crawford and M. Quentin B.L. Williams discussed what it means to be a good sports lawyer recently at a University of Houston Law Center CLE program. Feb. 16, 2017 – Three attorneys with years of experience in the NBA, NCAA and NFL shared some tricks of the sports law trade recently during "Touchdown! A Sports CLE Program" at the University of Houston Law Center. M. Quentin B.L. Williams served as moderator for the opening panel discussion, "Being a Good Sports Lawyer and In-house Counsel." Williams is the chairman and CEO of the Butler Lappert Williams Firm in New York. He previously worked as an FBI agent, former federal prosecutor, and attorney for the NBA and NFL. "There's no one recipe for getting into sports," he said. "There are many different ways to do it. I'm a firm believer that relationship-building is the way to go about business and to gain access to the sports world. If you meet one person who really believes in you, it's better than meeting 100 people who couldn't care less about you." Brook Gardiner, the NFL's vice president of labor relations, advised the audience that being a successful sports lawyer has little to do with supporting your favorite team. "Being a sports lawyer is not a lawyer who likes sports, or is a fan of sports," Gardiner said. "It's really a lawyer who's passionate about understanding the business of sports and having a deep understanding of the legal issues involved in sports." Derrick Crawford, the NCAA's Managing Director of Enforcement Investigations & Processing, encouraged aspiring sports lawyers to prioritize the development of practical skills and networking. He also echoed Gardiner's sentiments about not showing your team colors. "If you really want to get into sports, you really have to know people in the industry," Crawford said. It's super competitive. You really need to develop good legal skills. "The worst thing you can say if you want to work in sports as a lawyer is that you're a fan. It's probably helpful to know the terminology and to have a basic level of knowledge, but you shouldn't talk about how much you love the Houston Texans or Dallas Cowboys. That will turn your prospective employers off." Additional speakers included Law Center adjunct Professor Justen Barks '13 and Clinical Associate Professor Richard McElvaney who discussed athlete's likeness rights and merchandising and the legal issues surrounding fantasy sports websites like FanDuel and DraftKings. Professor Jessica Roberts, director of the Law Center's Health Law & Policy Institute followed with a talk titled "Analyzing the Issues of Athlete Health." The third panel discussion, "Sports & The Law – Real World Legal Issues and the Impact on Sport," was moderated by Law Center Dean Leonard M. Baynes and covered a wide array of topics including anti-discrimination laws, immigration and social issues. 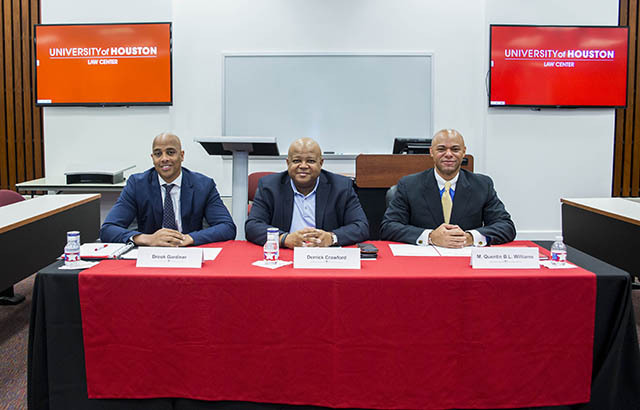 Panelists included Professor Emily Berman, Professor Michael Olivas, interim president of the University of Houston-Downtown, and Richard Craig Smith '00, a partner at Quinn Emanuel. The program concluded with a discussion led by Professors Gina Warren and Tracy Hester on the environmental impact of the Super Bowl. Attendees received five hours of continuing legal education credit, including an hour of ethics credit.